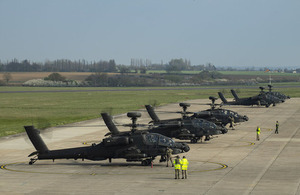 3 Regiment Army Air Corps is deploying to the Baltics for three months, with Apache attack helicopters of 663 Squadron taking off from their base at Wattisham Flying Station in Suffolk today. Before the Apaches departed from Wattisham, the Defence Secretary spoke with the soldiers who fly and maintain the aircraft to understand more about its capabilities and their mission. The first deployment of Apache helicopters to Estonia underlines our position at the forefront of NATO. This is a world class machine operated by world class Army aviators and this deployment demonstrates our unwavering commitment to NATO’s collective defence. The helicopter deployment will boost the UK’s presence in the Baltics – known as Operation CABRIT - to around 1,000 personnel, making the UK the largest contributor to eFP. The Wildcat’s surveillance ability combined with the Apache’s sensors and weaponry will be a step change in troops’ capabilities to detect, track and engage targets during the exercises they participate in. The deployment to Estonia is a fantastic opportunity for the Squadron to challenge itself. It will test how we deploy and operate overseas, develop our operational partnership with the Wildcat and our ability to work alongside our NATO allies. Everyone in the Squadron – from ground crew to pilots - has worked hard to prepare for Estonia, and we’re looking forward to establishing ourselves in theatre and contributing to NATO’s Enhanced Forward Presence.